In our day-to-day life, we got used to use many electrical and electronic components in designing electronics projects. These basic electrical and electronics components include resistors, ICs, converters, transistors, diodes, inductors, light emitting diodes, capacitors, thyristors or silicon controlled rectifiers, and so on. Thyristors are frequently used for various operations such as controlled rectification, switching purposes, cycloconverter, etc,. Here, in this article let us discuss about thyristor: what is a thyristor, thyristor symbol, thyristor characteristics, and thyristor applications. Thyristor is a multi-layer semiconductor device and consists of three terminals (anode terminal, cathode terminal, and gate terminal). The diodes are also called as uncontrolled rectifiers as they are unable to control (conducts in forward bias, i.e., when anode voltage is greater than the cathode voltage without any condition). But, the thyristors can be controlled, i.e., thyristors starts conduction only when triggering signal is given to the gate terminal (in fact, anode terminal voltage must be greater than cathode terminal voltage). 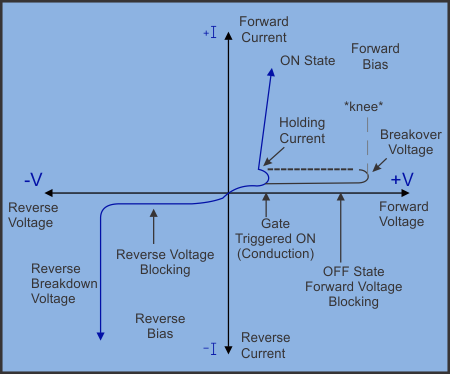 Thus, by giving gate triggering as per requirement, we can control the operation (ON or OFF) of thyristor. Hence, the thyristor is also termed as controlled rectifier and it is made of silicon, it is termed as silicon controlled rectifier. Generally, the diodes consists of two terminals, termed as two terminal rectifiers and transistors consists of three layers (P-N-P or N-P-N). But, thyristors consists of four layers (P-N-P-N) which are connected in series and having three P-N junctions. The thyristor is represented by the symbol as shown in the figure. Thyristor conducts only in one direction, hence, it is termed as unidirectional device. The thyristor can be used as a rectifying diode (controlled rectifier) and also as an open circuit switch by appropriate triggering. Typically silicon, gallium arsenide, silicon carbide, gallium nitride, etc., materials are used to manufacture thyristors. But, silicon is mostly preferred for the manufacturing of thyristors because of its good thermal conductivity, high current capability, high voltage capability, and so on. If the anode terminal and cathode terminal connections of the thyristors are reversed, then the lower diode and the upper diode get reverse biased. Hence, there will be no conduction path, so no current flow and hence, this mode is termed as a reverse blocking mode of thyristor. The thyristor remains switched off until the triggering pulse is given to the gate terminal. Thus, even though the thyristor is in forward biased condition but no current will be there indicating that both the upper diode and lower diode are in forward biased condition but, the junction between these diodes is reverse biased. Hence, no current will flow through thyristor (but no triggering pulse provided to the gate terminal) even though it is forward biased, so, this mode is termed as forward blocking mode. In the thyristor forward conducting mode, the anode terminal voltage will be greater than the cathode terminal voltage and the (third) gate terminal is also triggered appropriately. Thus, we can say that the thyristor is forward biased (Va-anode voltage is greater than Vk-cathode voltage) and also gate is triggered, hence, the thyristor conducts and this mode is termed as forward conducting mode. The above figure shows the thyristor characteristics and also represents different modes of operation of thyristor, such as reverse blocking, forward blocking, and forward conducting mode. The thyristor V-I characteristics represent different parameters such as reverse blocking voltage, breakover voltage, reverse breakdown voltage, forward blocking voltage, holding current, and so on as shown in the above figure. In general, thyristors are typically used in different electronic circuits which are dealing with huge currents (around 100A) and voltages (around 1kV). Thyristors are particularly used for reducing the circuit-internal power loss and for controlling power in the circuits. Thyristors are also used for rectification applications, i.e., for converting alternating current into direct current. 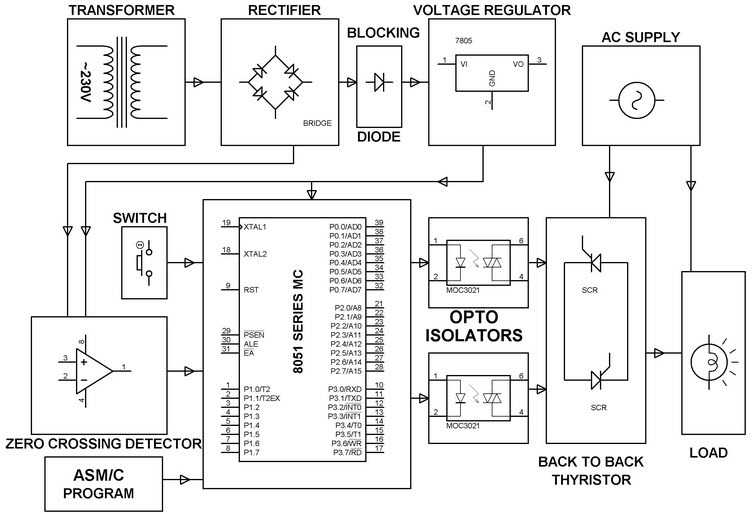 Thyristors are frequently used to design the AC to AC converters (cycloconverters). Speed control of induction motor using the thyristor power control technique is one of the practical application of thyristors. This method of controlling AC power to the load is the best technique and is more efficient compared to other techniques. 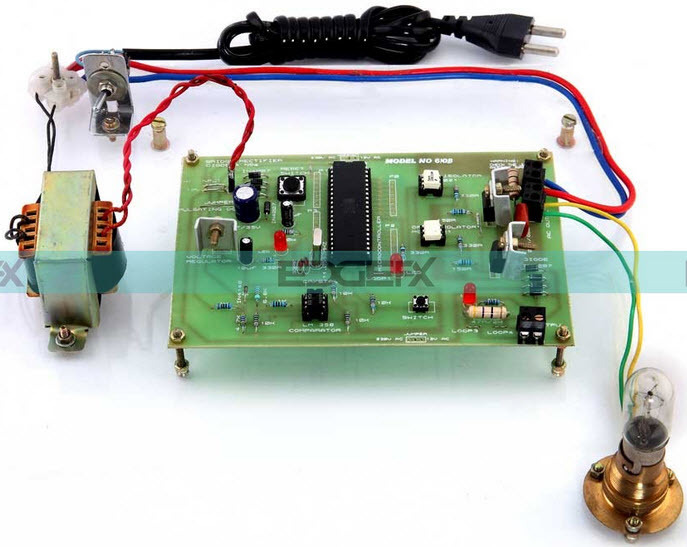 The project circuit consists of different blocks such as a power supply block, microcontroller, zero crossing detector, thyrsitor circuit, and so on. The power supply block is used for providing required power supply to the circuit. Zero crossing detector (amplifier is used) detects the zero crossing of the waveform and its output is given to the 8051 microcontroller. This microcontroller gives an output triggering signal (with appropriate delay) to the thyristor circuit through interfacing medium-Opto isolator. Thus, based on the triggering control the power supply to the load can be varied and speed of the motor can be controlled. Do you know thyristor triggering methods and commutation methods? For further technical assistance regarding electronics projects, please post your comments in the comments section below. Iˇve recently started a website, the information you provide on this site has helped me tremendously. Thanks for all of your time & work. Its like you read my mind! You seem to know a lot about this, like you wrote the book in it or something. I think that you can do with some pics to drive the message home a little bit, but instead of that, this is excellent blog. A fantastic read. I will definitely be back. Hiya very nice website!! Guy .. Beautiful .. Superb .. I will bookmark your web site and take the feeds additionally顡憑I am|I’m} glad to search out numerous useful information here within the submit, we’d like develop extra strategies in this regard, thank you for sharing. . . . . .
Hi, Neat post. There’s an issue with your web site in internet explorer, may test this顡?IE still is the market leader and a big portion of other folks will miss your excellent writing due to this problem. Hi my friend! I want to say that this post is amazing, great written and include almost all vital infos. I would like to peer extra posts like this . I see your page is in the same niche like my weblog. for you. Let me know if you are interested. however this piece of writing is truly a nice paragraph, make it up.